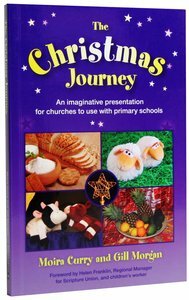 The Christmas Journey provides an exciting opportunity for church-based children's teams to perform a delightful, easy-to-do presentation to their local primary schools. Aimed at Year 2 children, the material gives pupils and teachers alike an enjoyable learning experience by unfolding the Christmas story through creative storytelling, simple drama, fun-filled puppetry and thought-provoking artefacts. Provides an opportunity for church-based children's teams to perform a delightful, easy-to-do presentation to their local primary schools. Suitable for Year 2 children, this title gives pupils and teachers alike a learning experience by unfolding the Christmas story through creative storytelling, simple drama, and fun-filled puppetry. Moira Curry has worked in primary education for over 25 years. Part of the church worship team, Moira is also a trained listener and tutor for Acorn Christian Healing Trust. Gill Morgan trained as a primary teacher with music as her main subject. Gill was also on the Spring Harvest leadership team for 5-8 year olds.